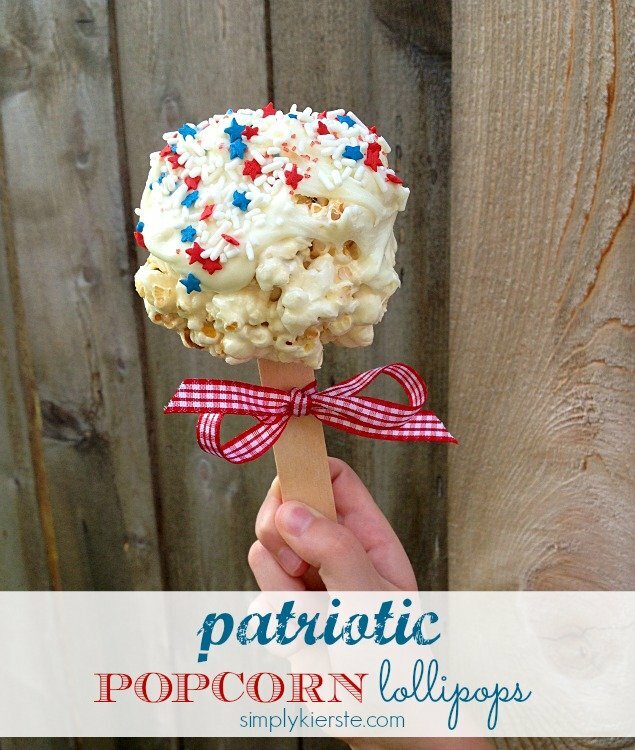 These darling Patriotic Popcorn Lollipops are perfect for Memorial Day, summertime, and for the 4th of July! They are super kid-friendly, fast and easy to make, and look darling! Serve these at your 4th of July BBQ, and they will be a sure-fire hit! My favorite way to make popcorn balls is with marshmallows–the same way you make Rice Krispie treats, but with popcorn. Melt the butter, add the marshmallows, and heat over a medium high heat, stirring constantly, until it’s nice and smooth. Pour it over the popcorn, stir with a wooden spoon until all the popcorn is covered. I let it rest for a few minutes, to let the marshmallow cool and harden a little, which makes it easier to form the popcorn balls. Coating your hands with butter is REALLY important when forming the popcorn balls, otherwise it will just stick like crazy to your hands and make a total mess. Once all the popcorn balls are formed, you can add the stick into the center of the ball to make it a lollipop! I usually use sucker or popsicle sticks, but I was out of both, so I used the thicker craft sticks. I wouldn’t recommend it–they were too thick, and caused the popcorn ball to divide much too easily. I’ve never had a problem with the other two, so I would definitely stick to those. After your lollipops are made, you’re ready to dip them into melted white chocolate, and then add patriotic sprinkles. Refrigerate until you’re ready to serve! These can be adapted to any holiday (we love doing them at Halloween), and they’re also perfect for birthday parties. Customize them with whatever color sprinkles you like! Popcorn Lollipops!! LOVE!!! Place the popped popcorn in an extra large bowl, with plenty of room to stir. Melt the butter in a large saucepan over medium high heat. Add the marshmallows, and stir constantly until smooth. Pour the marshmallow mixture over the popcorn, and use a wooden spoon to completely cover the popcorn. Let the mixture sit for about 5-10 minutes, to let the marshmallow cool–but not harden. Coat your hands with butter, then form the popcorn mixture into balls. Place them on a piece of wax paper that has also been rubbed with a little butter. Don’t use cooking spray–it leaves a yucky taste on the popcorn. Great idea! My sons 4th birthday is coming up soon and these would be PERFECT!! Can you please adopt me? lol You have the best projects!! :) <3 By the way – launched a new site – would love for you to stop by. I'll be featuring one of your project later on this week too!! I loved eating this snack!! This is so fun! Just pinned! I tried making these using the sticks, but at soon as I put the sticks in and stood them up (used styrofoam to keep them standing) they all fell apart. I ended up putting them in cupcake wrappers. Now my question to you is, why would they come apart? I followed your recipe. Also, when you yourself make these, what do you do with them once they’re prepared … Lay them down or stand them up? P.S. They were so good and my kids loved them! Yes, in hindsight I think it may have been too warm. I probably should have waited a bit longer. I will definitely try them again as they were a huge hit at my son’s birthday party. Thanks for your feedback! When I make them again I’ll be sure to comment here and let you know the outcome. 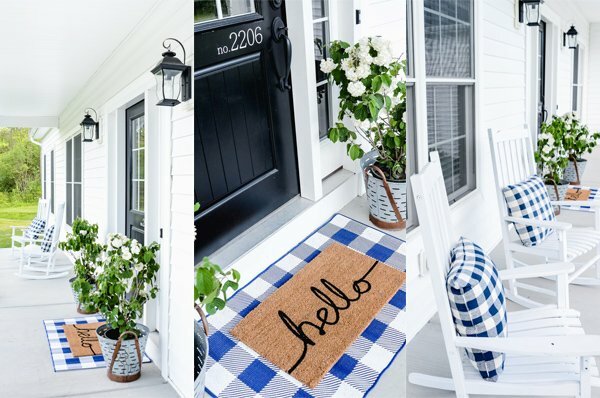 Hi, very cute, I’m thinking about letting the residents make them for Memorial Day project at a senior facility, can you tell me what size bag of white chips to use regular bag or the large bag. I used a regular size bag of chocolate chips, but you could always buy the bigger bags depending on how many seniors will be making them! Have fun!! We made these for a food craft project at our senior facility, Very tasty and fun to make. Any idea how many bags of microwave popcorn 16 cups would be?? The regular bags of popcorn usually have 9 cups of popped popcorn, so I think two bags would be great!